Anchored in Faith began playing as our worship band with the introduction of the New Horizons worship service in January 2013. The band, lead by Jim Kotora, practices on Thursday evening and plays at 11:00 AM on Sunday at New Horizons. Anchored in Faith members also participate in special music for services during the summer, at Cross Training and at Waypoint Youth events. Our adult choir leads the congregation in praise and song at our 9:00 AM Spirited Traditional worship. 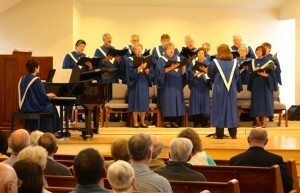 Lead by our Director of Music Ministry, Mary Fancher, the choir practices on Wednesday evenings at 7:30. The choir is always open to new singers and musicians looking to accompany them. Please contact Mary at fancherie@aol.com with questions. The choir is off from early June until early September.